Originally built as two log pens (cabins) with a center “dog trot” breezeway, the Pound farmstead has been meticulously restored to its composition and appearance from the period when Dr. Pound lived here. The Pounds had nine children, seven of whom lived to adulthood and were raised here. Four generations of family occupied the farmstead over a period of 130 years, until 1983. The family never modernized the home: in fact, the last living descendant to occupy the home in the 1980’s never installed indoor plumbing; still using an outhouse and outdoor bathing facilities. The only exception is that electricity was added in 1947. In addition, 90% of the museum’s collection belonged to the family members, making our display personal and unique. Today we are very happy to have as a docent to our museum the Great Great-Granddaughter (Wanda Mauldin) of Joseph & Sarah Pound. Joseph M. Pound first came to Texas in 1847 to fight in the war against Mexico. He returned to Kentucky to pursue his medical education, but returned with his wife, Sarah, in the early 1850’s. In 1854-55 they built a two-room log cabin in an untamed area of Central Texas, present day Dripping Springs. With an abundant source of water and rich soil, Dripping Springs was a desirable place to stay. It is believed Dripping Springs was part of the original wagon route from Austin to Fredericksburg and so the Pounds may have passed through on the journey. Settlers of the Texas Frontier faced many challenges, among them were maintaining peace with the Native American populations. The Kiowa and Comanche trail lies just southeast of the Pound property – one of the most active trails in the State. However, it is rumored that Dr. Pound was one settler who never had a horse stolen by raiding tribes, for the Indians revered him as medicine man and friend. Dr. Pound enjoyed a close and lasting relationship with the local Tonkawa. The Pound family envisioned a thriving, industrious and self-sustaining town and they worked hard to lay a firm foundation of community, education, and prosperity for future residents. 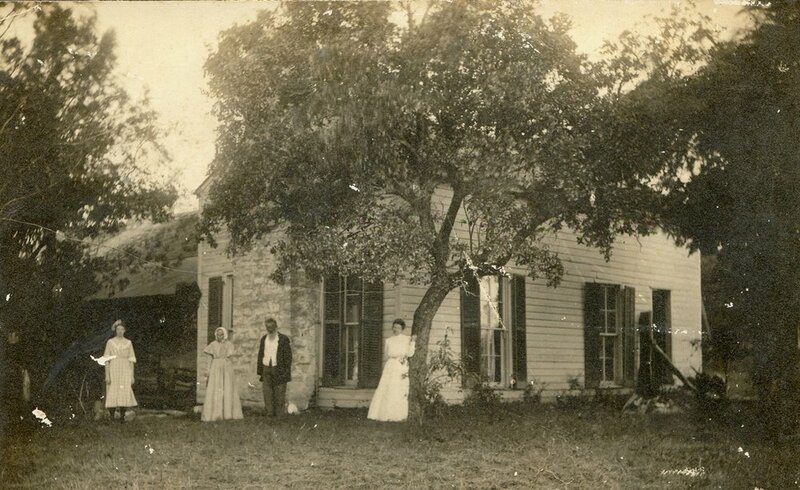 As a founding family of what is now Dripping Springs, the Pounds were at the hub of community life, opening their house and grounds to serve as a medical office and hospital, church sanctuary, schoolhouse, and social gathering place. Dr. Pound was well advanced in today's sustainable living mindset- having built into the home and out-buildings an attached rainwater collection cistern: a self-watering trough for the farm animals, and the amazing in-ground hot house that kept his medicinal herbs and vegetable seedlings growing all winter. 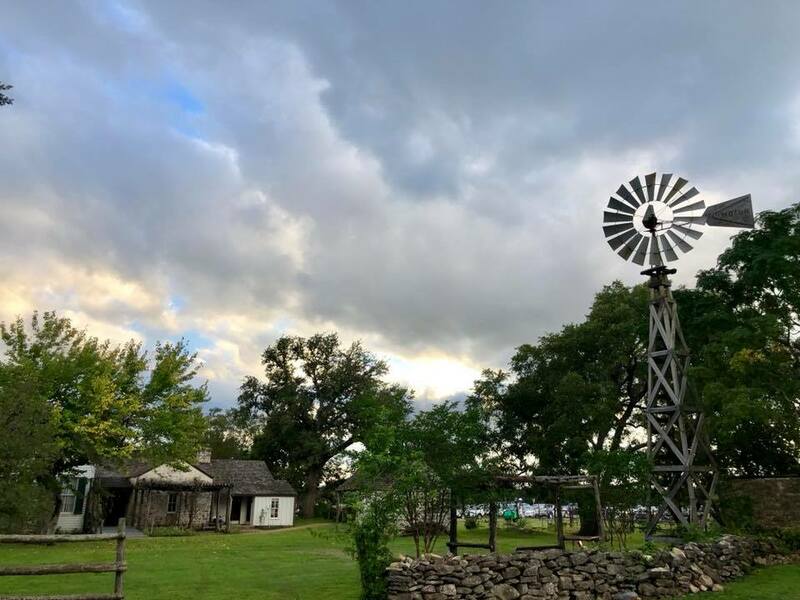 Experience the flourishing rural life of a Central Texas Pioneer and see the beautifully renovated barn, smokehouse, windmill, and garden areas. A real time-capsule, The Pound House offers a living depiction of early life in the Texas Hill Country for the common man. The peaceful gardens and grounds include an oak tree that is over 500 years old, which we call “The Heritage Oak”. Discover the antique roses that Sarah brought as cuttings to her new home from her native Mississippi in 1853 and still thrive today. The Pound House is included on the National Register of Historic Places and has been a Texas State Historical Landmark since 1965. It has been a museum since 2003, opening its doors on May 4th. Today the Dr. Pound Historical Farmstead provides historical education, a destination point for visitors and a gathering place for the community for the enjoyment and benefit of present and future generations. The Foundation consists of a fifteen member board, each serving a three year term. This is a working board responsible for the restoration, maintenance, and financial well-being of the Pound House. Friends of the Pound House Foundation(FPHF)is a 501(c)3 organization and donations are tax deductible to the fullest extent of the law. Donations allow the FPHF to continue restoration and maintenance of the Dr. Pound Historical Farmstead. More importantly, however, we will be able to continue to develop and offer quality educational programs to our local school children and to our community.